Stockholm is a magnificent city that I have had the pleasure of visiting several times now. I’m usually there in the long winter, when conditions are icy. Our business interests in Sweden usually dictate that we fly in, jump straight into a meeting, then to a business dinner, off to bed and fly out the next morning. Hardly time to draw breath on the delights of Stockholm. This visit, I had the pleasure of being in Stockholm for the weekend at the very start of Autumn, although the cloudless skies and warm days were picture perfect and more like the height of summer in this beautiful city. I had heard whispers of a new restaurant just opened, that was more akin to dining at a close friend’s home, and the pictures on the website further confirmed the intimacy and warmth of this little room. Although quite new, the first step in through the ancient door leaves one with the impression of a well established and lived in room. A small bar greets you as you enter, with smiling, welcoming faces behind it. I had booked on line, but due to a tech glitch it seemed that my booking had not made it into the book. Disaster! How were they going to fit us in on a Saturday night in a 28 pax restaurant. That’s right, only 28 covers! But fit us in they did with a minimum of fuss. The service is warm and friendly, the atmosphere charming and the room well appointed with soft furnishings, lounges and small tables. The mandatory curtained booth was also tucked away in a corner, for those more veiled private dinners. Settling in with a Campari & Soda, I started to study the documents in front of me. A menu cover explaining the ethos of the kitchen led the way: “With us you will experience the flavours of Sweden in the form of half potions. You have the option to choose one of our five-course tasting menus or combine your favourites from the different landscapes we have on the menu”. The kitchen has identified two different “landscapes” in Sweden to draw their produce from – Ostergotland & Halland, and the two menus reflect what is seasonal, fresh and exciting from those regions. We chose the Halland five course tasting menu, although they both looked equally delicious. The first of our two entrée courses of cockles and pork belly was a stunningly intense , garlicky sea-fresh soup. Simple and brilliantly executed. This was followed by a beautifully textured chicken liver parfait, light and fluffy, showing a deft hand at work in the kitchen. Two nicely framed main courses followed; firstly an elegant take on a bouillabaisse, showcasing the perch, shrimp and salmon from Halland. This was wonderful, the seafood fresh and the broth reduced, but not to a bitter intensity that often befalls this dish. (The week after, I was to have a Bouillabaisse at a 1 star Michelin restaurant in London that was bitter from over-reduction). Once again, this dish was light and focused. September is the start of the Reindeer season, and the second main course was a beautiful fillet of new season Reindeer, seared rare and finished with a simple but balanced orange glaze. More deliciousness. Beautifully cooked and rested, with sheer melt in the mouth texture. A pretty dessert of fresh elderberry, raspberry and strawberry with Halland flowers and a tangy coulis finished this mini degustation perfectly. Once again, light and full of natural, bright flavours. The small wine list at Oxelblom is clever and well thought out; featuring sixteen whites and sixteen reds along with a sprinkling of Rose’ and Champagne with almost half the wines available by the glass. From Priorat to Oregon, Alsace to Lisboa, there are plenty of interesting options to match the food brilliantly. Clearly, some thought has been carefully given to the essence of the food and what works well vinously with it. 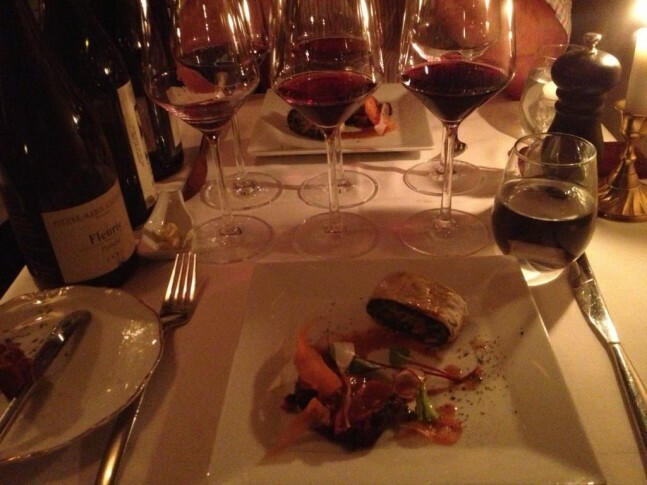 We polished off a lively and textured 2007 Schlumberger Grand Cru Saering Riesling along with a lively 2011 Poncie Beaujolais with consummate ease; the wines showing a lightless and freshness commensurate with the dishes. 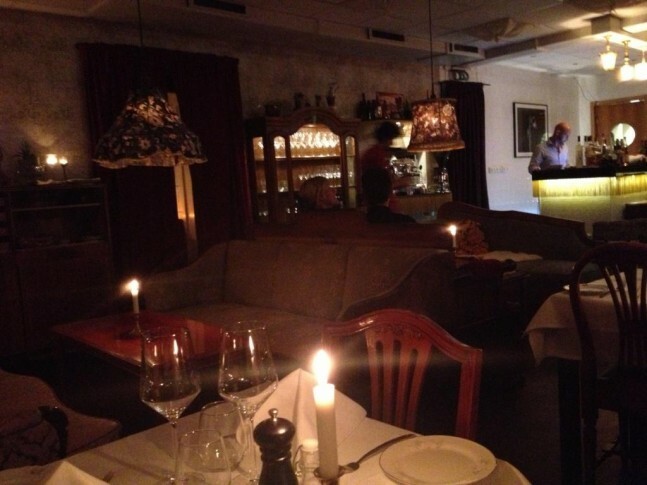 Firat Merwani, the young owner of Oxelblom has nailed it with this lovely little restaurant. Prices are fair, given that the cost of dining well in Stockholm can run quite high, and the ambience nothing short of unique and welcoming. Book ahead when you are planning to next be in Stockholm, but leave some time and space for a post prandial drink at their “Bahnhoff” bar next door, also worth checking out. Terry Chellappah is a founder and owner of Plan B Wines, and spends considerable time eating and drinking when travelling, while on business of course.